«©NCSX» Ever fumble around in the dark in a futile attempt to locate your bedside clock? The one that's next to your bed (thus the bedside clock label)? That time you were in a drunken stupor? 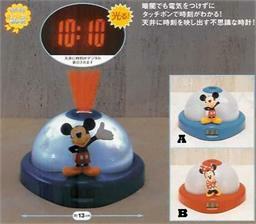 Feast your eyes on the Mickey Projector Clock which blazes out the time via laser-sharp light and plasters it on the ceiling. Simply tap the top of the clock and the light shines out like a beacon of hope. After a few seconds it'll blink off but if you need the time again, tap the clock again and the time appears once again. It's magic like that. During daytime, an LCD panel on the front of the clock tells time without having to tap. Runs on three AAA batteries which are not included. This item is a Japanese product that is not available in USA stores.